Melapimer 2012 Photo Gallery - More Photos !! Melapimer 2013 Photo Gallery .. More Photos !! The Tithi Patrika ( Sindhi Tipno) is unique to sindhi culture and ingenuity. 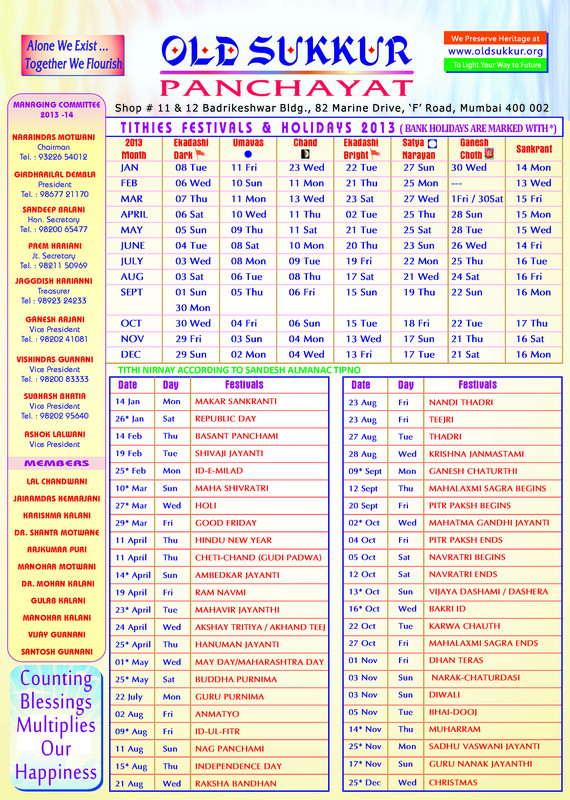 It is a one page summary (at a glance) of important TITHIS (especially used to determine days of fasting & days on which Non-vegetarian food is to be abstained from) and contains a List of Holidays (Bank/Govt) as also a List of Important Festivals. Thus, in a uniquely Sindhi way the Tipno saves time , saves space and yet successfully provides useful information at a glance. Developed & Maintained by -- Old Sukkur Panchayat . Legal disclaimer: Subject to jurisdiction of the courts at Mumbai, India only. Material contained herein is the opinion of the authors and Old sukkur Panchayat is not in agreement with all that is contained herein. Material is sourced from places thought to be reliable but , No warranties as to accuracy or correctness of the content are implied or may be inferred. Old Sukkur Panchayat is a Not-For-Profit Association and this is NOT a commercial website. This is a community website and the Information contained herein is for use of members of Old Sukkur Panchayat only.